In between visiting some friends from out-of-town in Vancouver this weekend, I hopped over to BC Place to see the new Terry Fox monument (new as in September 2011). 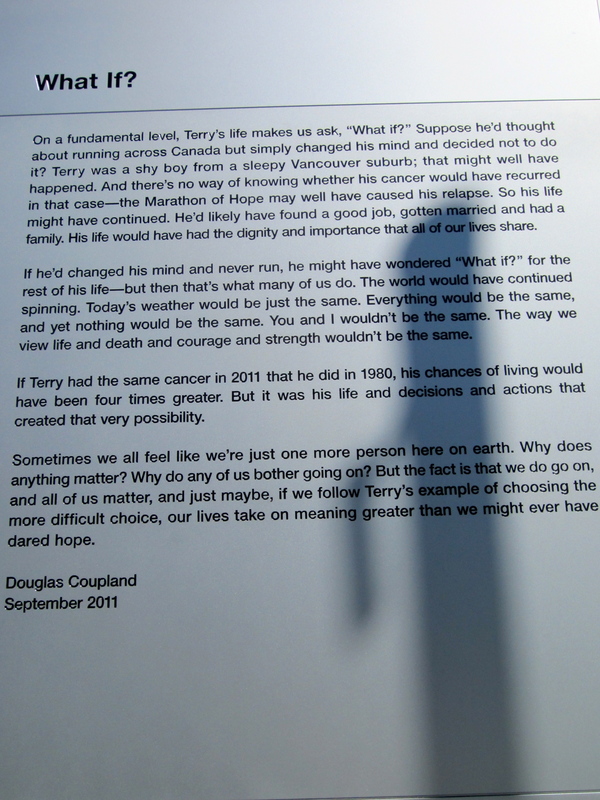 New Terry Fox memorial designed by Douglas Coupland. 2011. “Monument” seems like the wrong word to describe these Terry Fox statues. Yes, there are statues plural — four of them actually, each showing a separate stage of Terry’s distinct step-hop gait. The figures become progressively larger as he runs westward (his final destination was to be Stanley Park), indicating Terry’s growing legacy since 1980, when he started his Marathon of Hope run across Canada to raise money for cancer research. The old Vancouver monument for Terry Fox more accurately reflects the characteristics I associate with a monument: weighty, grand, symbolic, a structure of heroic proportions. The old classical triumphal arch designed by Franklin Allen surely is all that. I never saw this monument in real life (I tried once but it was covered up with a big white tarp while construction was being done on BC Place’s new roof), but apparently it received a lot of criticism and many people considered it an eyesore, which is not hard to see why. Old Terry Fox monument designed by Franklin Allen. 1984. Franklin Allen’s 1980s postmodern monument has all the signature moves of its time – a polychromed structure in the latest colours as well as a poly-textured structure with tile, brick, and steel. Four fibreglass lions sit atop the arch, symbolizing Terry’s heroism. All these elements combine to make this modern pastiche of a classical triumphal arch. Pastiche is one characteristic of the postmodern architectural style — another is the irony of attempting to set in stone and make permanent something that is not permanent. How do you monumentalize a fleeting, short life such as Terry’s? Trevor Boddy writes, “This sense of monumentalising the pungently ephemeral, of reconciling emotions with visuals, of rendering permanent a patter in the social electron flow of a few months duration, was crucial to the winning scheme’s selection by a jury not otherwise committed to postmodernism as theory or style” (Allen’s monument was the winner of a design competition). How do we attempt to remember a significant person or event in history? Monuments surely are one way. Yet why did the old statue get so much criticism? Boddy explains because it didn’t include any visual representation of Terry, the person it attempted to remember. Boddy goes on to say that in order to appease the public outcry over this monument, etched steel plates bearing larger-than-lifesize photographs of Terry were placed inside the arch, much to the architect’s chagrin. I guess the symbolic fibreglass lions weren’t enough — we like to see images that resemble the person we are remembering. So it’s interesting that over two decades later, a new memorial (I hesitate to say “monument” for the above reasons) of Terry Fox has replaced the old one, and the differences couldn’t be more obvious. In Douglas Coupland’s Terry Fox sculptures, the public doesn’t just get one, but four images or motions of Terry, broken down into a four-frame cycle. They are open, life-like. You can walk around them. You might not even notice them from a distance because on a busy day around BC Place, Terry blends right into the crowd. Can you see the statues? Allen’s arch was ostentatious, noticeable, built to match a national hero; Coupland’s statues are subtle, built to commemorate a national hero but also to remember an individual whose single act of determination inspired hope, rallied the country, and changed lives — a determination meant to inspire and challenge us us on a personal level. It is this humanness and point of connection between Terry and ourselves that I come away with from the new memorial. This entry was posted in Art, Vancouver and tagged Architecture, BC Place, classical architecture, Douglas Coupland, Franklin Allen, hero, legacy, Marathon of Hope, memorial, postmodern architecture, postmodernism, sculpture, Stanley Park, Terry Fox, Trevor Boddy, triumphal arch, Vancouver, Vancouver architecture, West Coast Architecture by Charlene Kwiatkowski. Bookmark the permalink.